One of the reasons I love living in the upper Midwest is that we have four proper seasons; it is an ever-changing environment rich in diversity and therefore satisfying to my ever-curious photographer’s eye and sometimes restless soul. But as beautiful as our winter often is, to be honest, there are times it cansuck more than a $650 Dyson. Case in point: this past week’s “polar vortex”, commonly known as a January deep freeze. After lowering the thermostat and dumping an average foot of snow across the lower part of the state, Mother turned off the furnace altogether and plunged the region into seriously sub-zero temperatures for a couple of days. We were ready; groceries purchased for the humans after standing in a line 8 people deep that wouldn’t have been relieved by going to another of the 2 dozen register since the line for each one was equally long, and nuts and the heated birdbath readied for the wild critters. When you are prepared, barring a freak failure of furnace or water pipe, these things become rather a non-event. Nothing to do, really; just work from home and watch what is not going on through the window on the chance a furball will decide to make its way to the feeder for a much-needed fill-up. We had one such little visitor the morning after the worst night of the cold snap. Braving the arctic temperatures it moved through the tree branches in the morning’s sunshine on the daily mission to look over the territory and eventually check for nuts in the food dish. I’d spotted it as it first made it way across the back; a lone silhouette seemingly unconcerned with its severely frostbitten surroundings. It caught my eye a short while later when it finally appeared under the bird feeder in the front but when it spooked and swam across the yard through the deep snow to the safety of the tree my spider sense was piqued. Something about the little black squirrel wasn’t right. I quickly put some nuts out for it and from the warmth of the house I tried to get a good look at it through both binoculars and camera lens. There was what seemed mostly like strings of redness on one side of its face; errant bits of bedding or, as it hunkered down in a posture that indicates not feeling so hot, had it been injured? Hard to tell for sure with the sun shining so clearly behind it. Eventually the squirrel made its way to the porch to eat and there I was able to get a much better look and, to my relief, it appeared only that a frostbitten ear had gotten banged and so bled; albeit bled heavily, as such wounds tend to do. What I’d spotted but was unable to see clearly before were bits of blood frozen in tiny streams and droplets clinging to the fur on the side of the squirrel’s dark face. As the youngster contentedly ate its fill the frozen redness slowly dropped off; the next day there was no sign of the injury except a bit of floppiness in the slightly-enlarged ear. In fact, if you weren’t especially observant and knew what you were looking for, you’d not be able to distinguish this particular youngster from the others. And so, despite the very real danger of the storm, everyone survived in fine shape. Our full-color, 12-month annual Squirrel Calendar for 2019 is now available! Remember, they make great gifts and all proceeds go towards the care of our wild residents. 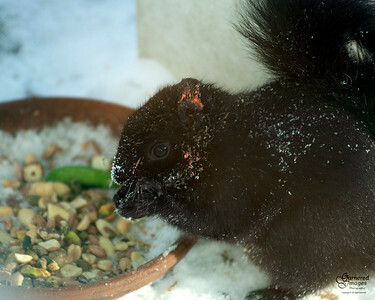 We are currently raising funds to run blood panels on Eastern fox squirrels for research and reference purposes. CLICK HERE to learn more. Alexander T. Squirrel Wants YOU! Click on Alex to donate using Paypal. Feed The Squirrels The Easy Way! Use Good Search for your searching and shopping and they will donate money to A Squirrel's Tale. © PJ. Garner, Garnered Images Photography and SquirrelTale.com. All rights reserved. Unauthorized use and/or duplication of this material without express and written permission from this blog’s author and/or owner is strictly prohibited. Excerpts and links may be used, provided that full and clear credit is given to PJ. Garner and SquirrelTale.com with appropriate and specific direction to the original content. Shop eBay now to support our cause! Here's big THANK YOU to some of our present and past eBay sellers who've listed multiple items with eBay Giving Works in support of A Squirrel's Tale. You folks are wonderful!